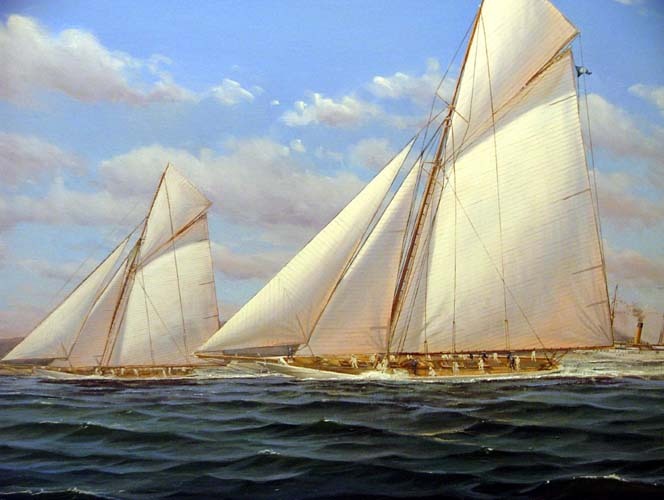 Framed Oil Painting on Canvas 24 x 36 inches (61 x 91.5 cm) (Unframed canvas size) Built by Nat Heresoff in 1901 as the new America's Cup defender, Constitution had to win the right to defend by beating the current champion Columbia...and in 1901 both Columbia and her crew were in perfect racing trim. Despite this, Heresoff believed that Constitution would prove the better and faster yacht but her crew were outsmarted and out-sailed by Columbia who had the legendary Charlie Barr at the helm. Constitution came back in 1903 to defeat Columbia in that year's America's Cup time trials but in her turn Constitution was defeated by the more modern Reliance, who also had Charlie Barr at the helm.